In a large bowl, mix kiwis, apples, strawberries, raspberries, white sugar, brown sugar and fruit preserves. You may not need all of the sugar depending how sweet your fruit already is naturally. Cover and chill in the refrigerator at least 15 minutes. Serve with cinnamon graham crackers or cinnamon pita chips. Sometimes I serve some salsa in a small bowl and sprinkle Cinnamon Toast Crunch™ cereal on top for a healthy snack. As the summer winds down, it’s time to take full advantage of the fabulous fruits that are in season now before we have to bust out our coats. 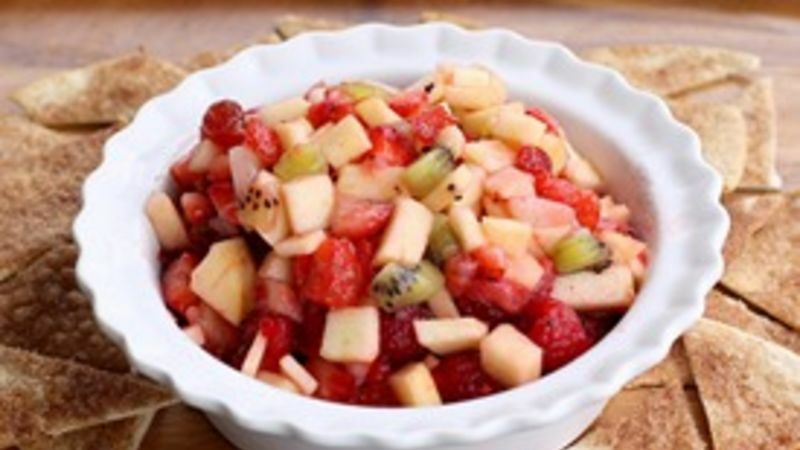 This Fruit Salsa is a great way to say adios to summer with fresh strawberries, raspberries, kiwis, and apples for a perfect crunch. You can add some sugar to your fruit if it isn’t sweet enough, but this time of year your fruit should have enough natural sweetness without needing a thing. 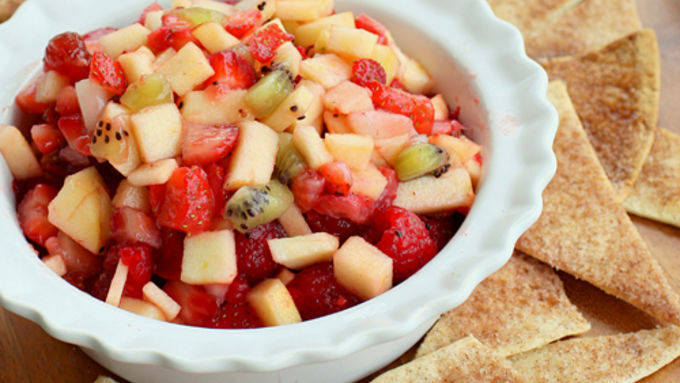 This Fruit Salsa appetizer is always a hit at baby showers, barbecues…you name it. It’s a unique salsa that always gets rave reviews for its bright flavor. The women are attracted to it because it’s a light appetizer and the men love it because it’s just that good. And right now since all of the fruits are still in season, you can make this salsa for a reasonable price. 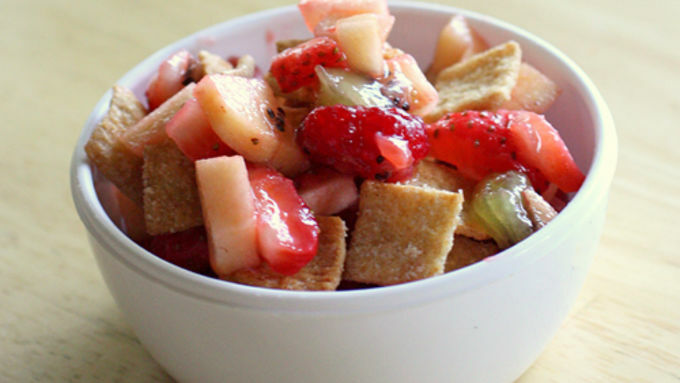 I like serving this fruit salsa with cinnamon graham crackers or cinnamon pita chips. If I’m eating it at home, I like to simply put some in a small bowl, sprinkle some Cinnamon Toast Crunch cereal on top, and eat it with a spoon. Yum! A healthy afternoon snack! The Cinnamon Toast Crunch has the cinnamon flavor and the crunch that compliments the salsa perfectly. Recipes with Fruit Summer's slipping, so get your fresh fruit fix while you can with the fruit salsa recipe above and more fruit recipes like these.